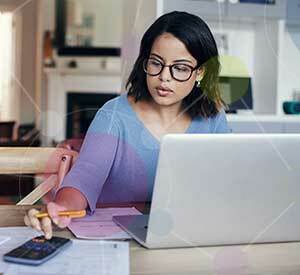 Research reveals that banks and credit unions still have a long way to go to satisfy digital consumers who want to open new accounts online or with mobile devices. This experience gap is costly, resulting in lost sales, reduced revenue and bad first impressions. 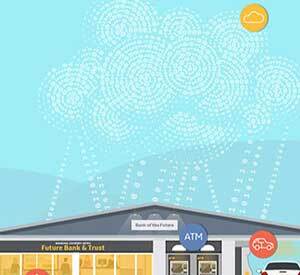 Customers want to interact with their financial institution where, when, and how they want. 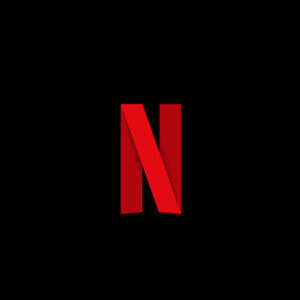 This requires the ability to open new accounts through any channel, and to be able to switch from one channel to the next without starting the process over. The customer should also be able to open accounts seamlessly, without leaving a channel if they prefer. 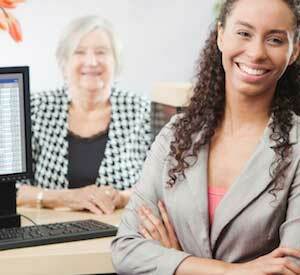 Customers want their first interaction with a bank to be simple and require minimal data entry. They want the bank to get to the point of “know me” as quickly as possible, so it can “understand me” and “reward me”. 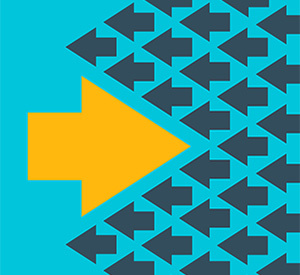 The overlap between acquisition and onboarding must be kept in mind. 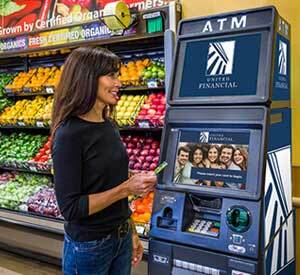 In reality, acquiring a deposit account should be the first step in the new customer onboarding process. Influencing account usage as well as recommending additional solutions is part of building engagement and trust. The delineation of new account opening is clear. People who prefer to open a new account in a branch do not want to be forced to use digital channels. Similarly, digital-first consumers do not want to only complete part of the process online or on a mobile device, only to be forced into a branch to complete the process. The majority of institutions can’t open an account entirely online or on a mobile device, but larger organizations are more likely to support mobile account opening. 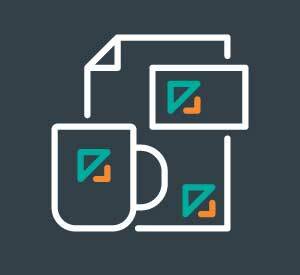 ID verification and signatures/supporting documentation “at the branch” are still required by the majority of organizations. A “save and resume” functionality is not supported by most financial institutions, especially with mobile opening. The time to complete both online and mobile applications is still sub-optimal, with some digital processes taking more than 10 minutes. 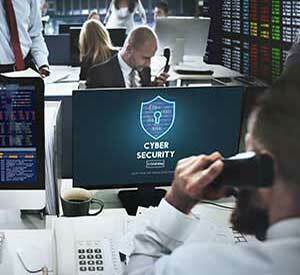 While abandonment of digital account opening is still a significant problem, increased digitalization of the process and improved speed of application can help to solve this issue. 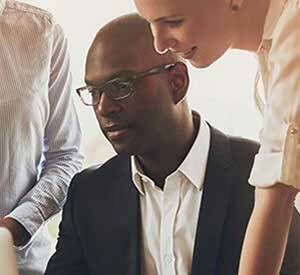 The migration from physical stores to computers and mobile devices cuts across all industries, from retail to travel and hospitality to banking. 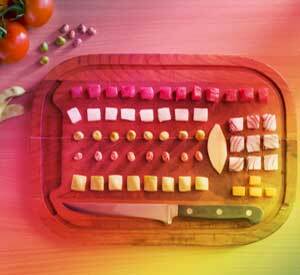 The goal is a more convenient buying experience, and the simplifying of daily life. This shift to digital channels is becoming a differentiator in the competition for banking customers. New customers opening their first bank account are making decisions based on the ease of account opening and the capabilities of digital banking apps. This is why the largest financial organizations are gaining market share and getting the highest customer satisfaction ratings. 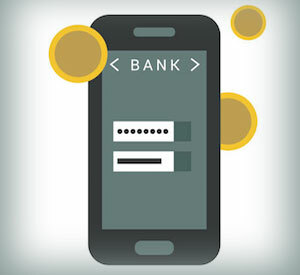 In fact, only 18% of banks and credit unions surveyed offer mobile account opening. While this is up 4% from 2016, it is still anemic growth at a time when consumers are expecting more. 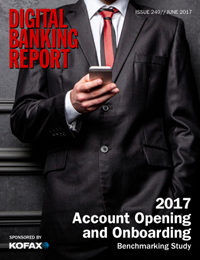 It is encouraging that the number of organizations indicating that they can open new checking accounts with online or website tools jumped from less than 50% in 2016 to 66% this year. 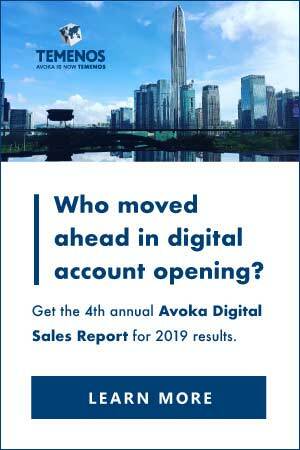 When we look at the responses based on both size and type of organization, we find that the move to digital account opening is most prevalent among the largest organizations. In fact, the ability to open accounts via a website or mobile app for organizations larger than $1B jumped by more than 10%. For organizations larger than $50B, the number of organizations offering mobile account opening approaches 50%. In our survey, 48% of the institutions surveyed indicated that the entire online account opening can be done without coming into the branch at all. This compares with only 43% in 2016. While this is still below where it needs to be, there appears to be an increasing commitment to being a ‘digital bank’. Organizations who indicated that they plan to have this capability in the next year also jumped from 27% to 31% this year. As shown below, the number of financial institutions that provide end-to-end checking account opening with a mobile device (24%) is far lower than those who said they offered online account opening (48%). 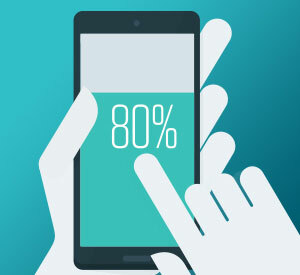 Despite this anemic number, there is a significant improvement over the percentage of organizations that could provide end-to-end mobile opening in 2016 (17%). A ray of hope exists though when we consider that the number of organizations indicating that there are no plans to offer mobile account opening via a mobile device (23%) is significantly lower than what we found in 2016 (35%). Warning: As we have indicated in the past, when a new customer is required to visit the branch to complete the account opening, the branch staff is often provided an incentive to start the process completely over to receive credit and/or commission for the sale. This hijacking of the online account opening process usually invalidates measurement of channel attribution since there is only measurement of last channel used. As mentioned, today’s digital consumer expects ease of use, a clean design and speed. 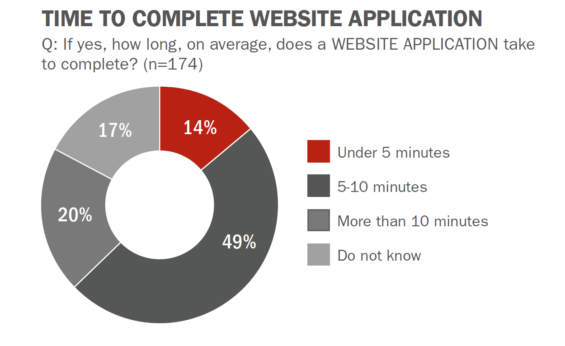 Well, unfortunately that does not seem to be the norm when a person wants to open an account online or on a mobile device, The research from the Digital Banking Report found that only 14% of organizations surveyed had an online account opening process that took less than 5 minutes, with 20% taking longer than 10 minutes. 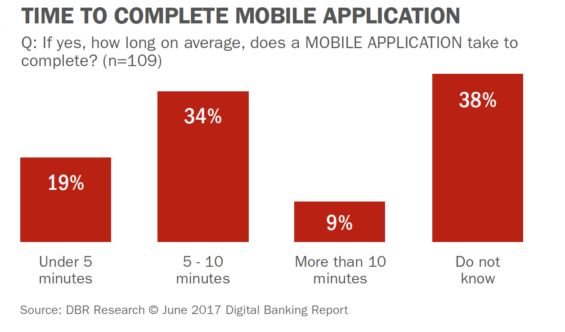 As would be expected, the Digital Banking Report research found better time to complete results for mobile banking applications, with only 9% of organizations indicating an account opening process that exceeded 10 minutes. A bit frightening, the number of organizations that do not know the speed of mobile account opening far exceeded the percentage that did not know the speed of online opening (38% vs. 17% respectively). This may be partially caused by the number of organizations that have only recently supported this channel. The impact of an increased time required to complete is simple … abandonment of the process by the prospective customer. 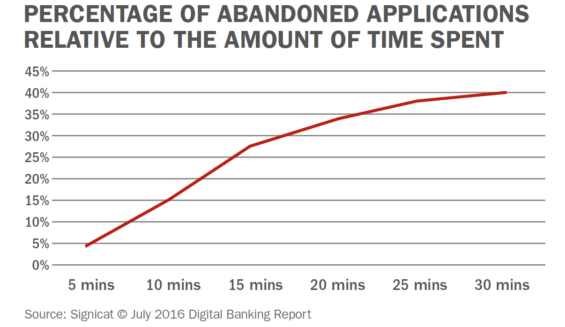 In the Digital Banking Report, State of the Digital Customer Journey, it was found that abandonment rates increased significantly as the time to complete an application increased. In 2016, 27% of the organizations surveyed indicated that more than a quarter of their customers who began the online account opening process abandoned the process before opening an account. This year, the abandonment rate for online account openers dropped to 19%. 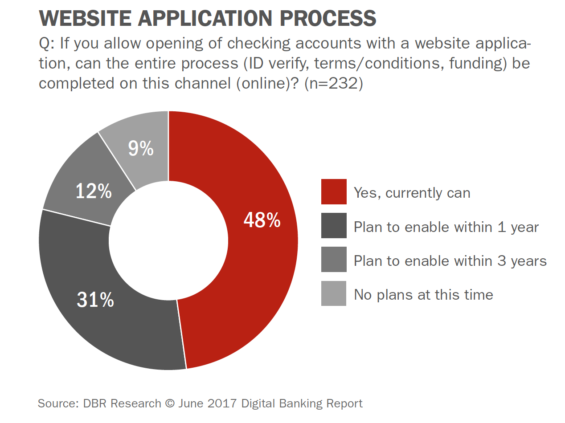 Similar to 2016, more than 50% of those surveyed have no idea how many customers begin opening an account online and then abandon the process. This is a combination of those firms who don’t measure the abandonment rate (19%) or because they “just don’t know” (33%). 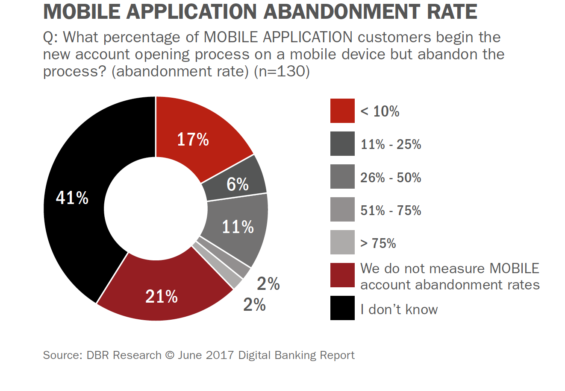 As was the case in 2016, the rate of abandonment for the mobile account opening process is lower than what we found for online account opening. This is because the time needed to complete the process is less than for the online process and because more organizations are improving the mobile account opening process. 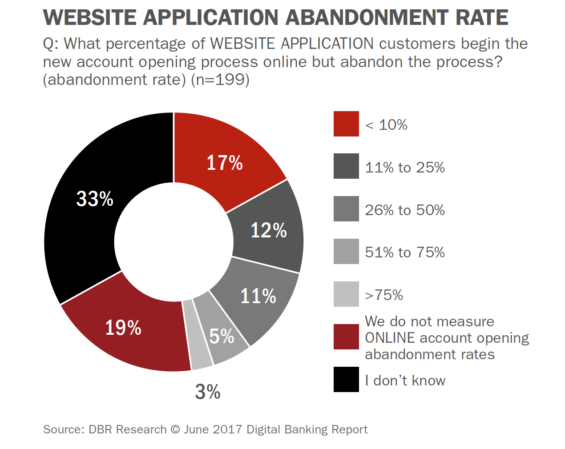 As was the case in previous Digital Banking Report research, the percentages of firms who don’t measure mobile account opening abandonment or just “don’t know” are concerning. Part of the challenge in quantifying this question could be that not all surveys were responded to by the head of the mobile team. 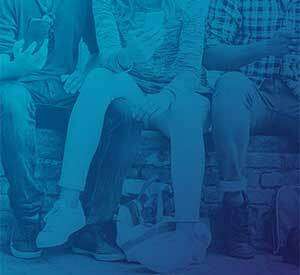 This lack of monitoring abandonment rates for online or mobile account opening eliminates the potential to retarget the customer who started opening an account. 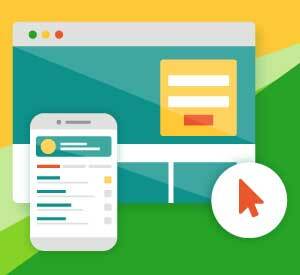 Without retargeting, the potential customer could look for an organization that makes the online or mobile account opening process simpler. 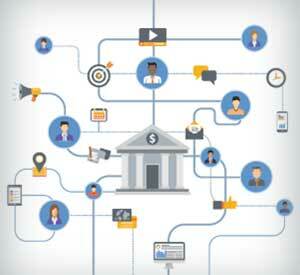 Banks and credit unions must respond to the expectations of the increasingly digital consumer. With most consumers doing their shopping for new banking products and new financial services providers using digital channels, there is an expectation that they should be able to complete the purchase process online or with a mobile device. 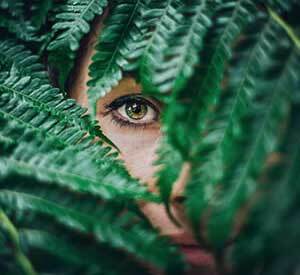 As the research shows, making the prospective customer change channels (usually by coming into a branch), creates an opportunity for frustration and eventual account opening abandonment. 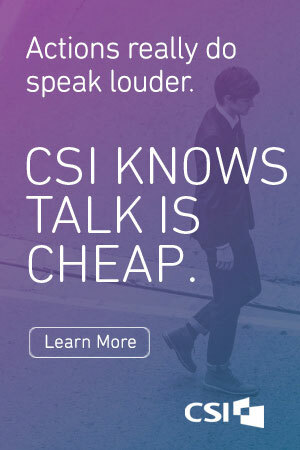 This results in lost revenue, broken trust and negative word of mouth. There are many providers of services to improve the digital account opening process. 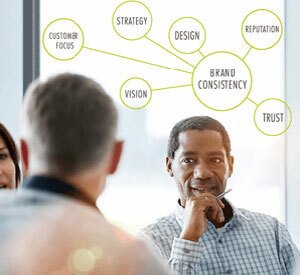 These firms can help remove friction, increase engagement and improve customer satisfaction. Providing a seamless, simple and engaging digital account opening process should be a top priority at all banks and credit unions. This article was originally published on July 10, 2017 . All content © 2019 by The Financial Brand and may not be reproduced by any means without permission.